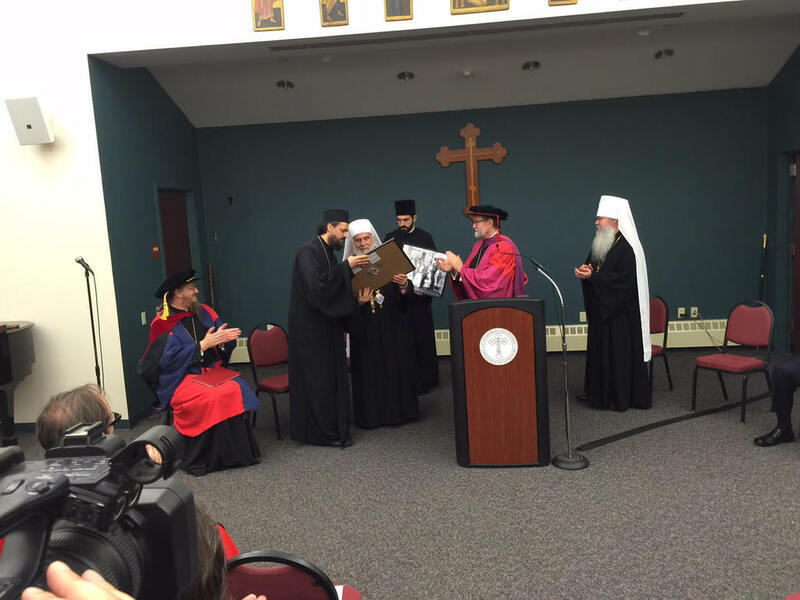 Crestwood, NY - On Friday evening, September 11, 2015, His Beatitude, Metropolitan Tikhon, Primate of the Orthodox Church in America and President of Saint Vladimir’s Seminary, welcomed His Holiness, Patriarch Irinej of Serbia to the seminary campus, where he was awarded an Honorary Doctorate during an academic convocation and delivered a well-received lecture. Patriarch Irinej’s visit came just days after he presided at the canonization of Saints Sebastian [Dabovich] of San Francisco and Jackson, the first American-born Orthodox priest, and Mardarije [Uskokovic] of Libertyville, the first bishop of the Serbian Diocese in America, which took place in Alhambra, CA on Saturday, September 5. Accompanying Patriarch Irinej were His Grace, Bishop Maxim of the Western American Diocese; His Grace, Bishop Mitrophan of the Eastern American Diocese; and His Grace, Bishop Justin of Zica; dean of the Faculty of Orthodox Theology of the University of Belgrade protopresbyter-stavrophor Dr. Predrag Puzovic; Professor Dr. Bogoljub Sijakovic etc. 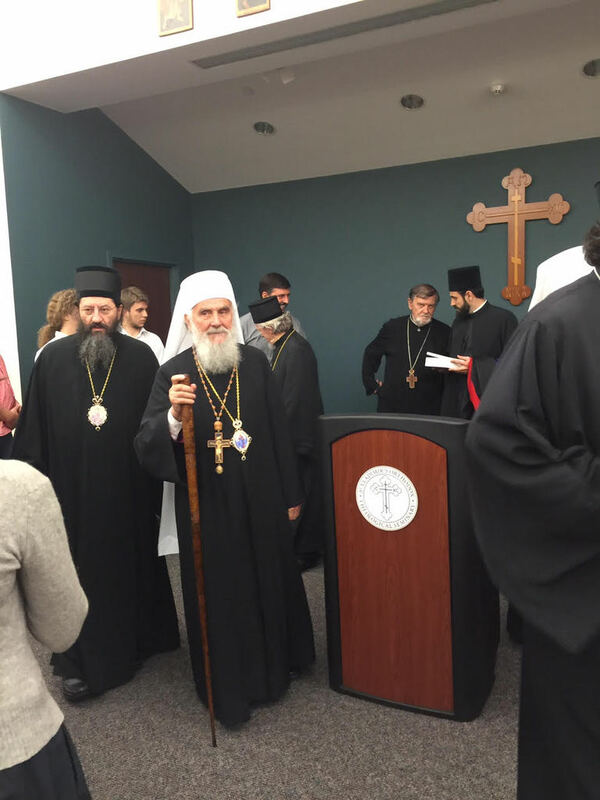 Metropolitan Tikhon and the seminary clergy, faculty, staff, students, trustees and guests welcomed Patriarch Irinej in the seminary’s Three Hierarch’s Chapel, where he venerated the relics of Saint Vladimir and the Holy Hierarchs Basil the Great, Gregory the Theologian and John Chrysostom. After the singing of the troparia of the newly glorified Saints Sebastian and Mardarije, Metropolitan Tikhon offered official greetings on behalf of the OCA Holy Synod of Bishops and presented the Patriarch with a panagia. Patriarch Irinej, the 45th Patriarch of Serbia, was enthroned in his present position in January 2010. He was ordained as a hieromonk in 1959. After his consecration to the episcopacy, he served as Bishop of Moravica and Nis prior to his election as Patriarch. He also was both a professor and rector of Prizren Seminary. I am very grateful for the honor you are giving me this evening. The bestowal of an honorary doctorate shows that, in effect, you are receiving me into your academic family, together with Patriarch Pavle of blessed memory, who also received an honorary doctorate from you. Such a reception, I would venture to say, obliges me to be mindful of the many gifts our Orthodox Church of Serbia has received from this school. For many decades the School of St Vladimir’s, thanks to Fr. John Meyendorff and Fr. Alexander Schmemann of blessed memory, with its theological “climate,” has been for many of our countrymen a real seminary, a “nursery,” and a point of reference. For over seventy-five years you have been nourishing the global Orthodox Church with criteria of a theological orientation, deeply marking the consciousness of the Orthodox Church. In this spirit I submit for your consideration certain reflections on the way the Christian Church understands its theological witness in the beginning of the new millennium. The customary brief lecture that I shall now deliver is titled: Theology as a Hope for the Future of the Church. However, we cannot decide on these criteria unless we answer the question: What kind of hope does the Church offer? The Church is a place where the God-man has instilled His mode of being through His incarnation and resurrection. That mode leads us to the level of person (relation and self-offering) and not the level of individuum (self-sufficiency and self-protection). Only a person can live life as a self-offering being; the individuum is not capable of sharing. The greatest good is not the happiness of the individual, but a life of gratitude and self-offering. In our Christian tradition God is revealed, known, and communicated as a perfect communion of the Three Persons, and not simply as a “being” or impersonal Principle or Power. The Church is the work of God in history and, thus, It, within Itself, must be a reflection of the Triune God. In the image of the crucified and resurrected Christ, who “takes away the sin of the world” (John 1:29), the Church also receives the tragic and sinful experiences and failures of man, for it is the Body of the Crucified Lord. In order to save the world, the Church must pass through the reality of death. As St. Paul says, death takes place within us (the Apostles), so that life can begin inside you (i.e., the Corinthians and members of the Church). (cf. 2 Cor. 4:6-12). This is what real saints do. Without this identification with the tragic destiny of the world, there is no salvation of the world. The Holy Eucharist demonstrates that the Church exists for the entire creation and not simply for itself or humanity. So, by expanding their horizons, the Orthodox seminaries and schools should be open to all human concerns in social and everyday life, just as the merciful Samaritan helped the wounded man by pouring wine and oil upon his wounds (cf. Luke 10:34). One of the many gifts that Fr. Alexander Schmemann exhibited during his long ministry to the Church and which has impressed most of us very much was his ability to combine his liturgical interests with a remarkable theological mind. For him theology and Liturgy were inseparable twins. In the light of the Eucharist we see other aspects of our ecclesial life. Conciliarity, as an Eucharistic manifestation of the catholicity of the Church, preserved us from being simply a “multiverse” (polycephaly) of Orthodox Churches containing an indefinite number of autocephalies, each with its own canon laws of functioning but with a difficulty to speak on all issues with one voice. If the 21st century becomes “the century of the synodality,” this difficulty might be prevented. Through the tradition of synodality (catholicity, sobornost) an opportunity is provided to every individual church to confirm its faithfulness to the Eucharistic Body of the one Christ. It is important today to move from mimicking tradition and “recycling” theology (a mere repetition of accepted definitions) to opening our ears so that we may hear “what the Spirit says to the churches” (Rev. 2:7) and receive from Him the yeast that “leavens” the whole of history. Let me turn to the next point of this evening: the exchange that took place between St. Vladimir’s Seminary and the Serbian Orthodox Church. 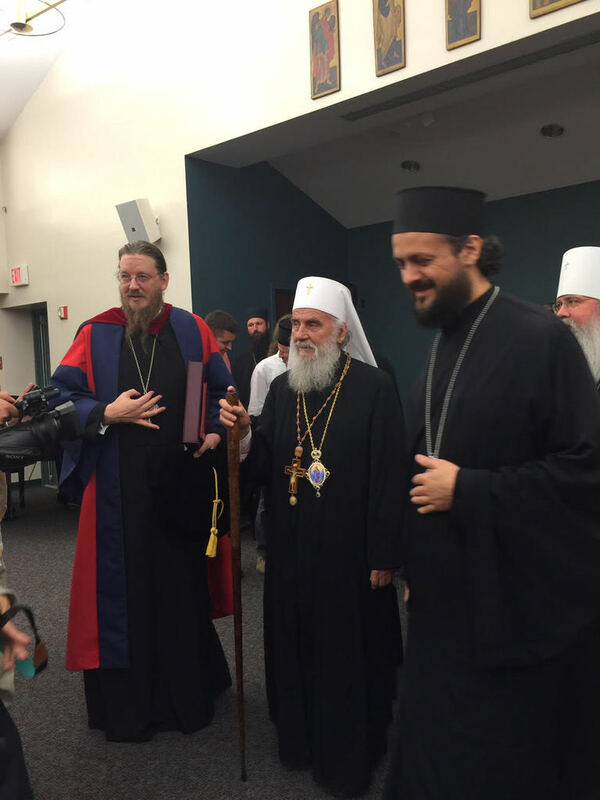 I want to express my gratitude to St. Vladimir's for hosting so many Serbian students who always looked at this institution with admiration, for it is indeed one of the most important theological centers in the entire Orthodox world, a place where that can broaden their horizons and serve the Church in the best way in our times. In the above-mentioned talk St Nicholai of Žiča, he characteristically said something that, in my opinion, faithfully describes the spirit and direction of St. Vladimir's educational atmosphere: “Christianity is a religion not so much of principles, rules and precepts, but primarily and above all of personal attachments, in the first place an affectionate attachment to the person of our Lord Jesus Christ, and through him to other members of the Church, the living and the dead.... The benefits we are drawing from such personalism in the doctrine of causality are manifold... It helps us enourmously toward educating and forming strong personal, or individual, characters. It inspires us with a spirit of optimistic heroism in suffering, self-sacrificing, and in enduring martyrdom for Christ's sake beyond description, as testified in our Church history” (Ibid., p. 390). But it is not only the students. It is a well-known fact that this institution is proud of the Serbian members of its Board of Trustees, Brian Gerich, Mitch Zunich, Leon Lysacht, Bishop Maxim, and Alex Machaskee. In addition to previous history, a new chapter opened with the cooperation between St. Vladimir's and the Faculty of Orthodox Theology in Belgrade. While it started a long time ago, it was recently ratified with an agreement and the new project was named the “St. Nikolai of Žiča and South Canaan and St. Justin of Ćelije Serbian House of Studies at Saint Vladimir’s Orthodox Theological Seminary.” We are glad to read that the purposes of this House of Studies are: to promote a sustained presence of Serbian Orthodox theological traditions in America; to promote a sustained dialogue between Orthodoxy in Serbia and America; to provide the highest level of education, incorporating Serbian theological traditions (heritage, history, liturgy), for the service of the Serbian Orthodox Church in America; to provide an experience of Orthodoxy in the West for theological students from Serbia and a place for research for faculty from Serbia; to be a liaison-center for Serbian alumni in the US and throughout the world; and, to conduct events throughout the year promoting its work. The “yeasting” of Orthodoxy currently taking place in the Americas invites us to participate in it in order to provide an impetus for a contemporary and creative ecclesial self-awareness. The Church as a whole must use this yeasting as an occasion for self-examination and self-criticism. The acknowledgement before the world of the sanctity of St. Sebastian and St. Mardarije points to the truth that the future of the Orthodox Church depends largely on the so-called “Diaspora.” As the “Jews of the Diaspora” in the second and third century paved the way for the then “ecumene” (the Greek and Roman world) to accept the Word Incarnate (they also played a definitive part in clarifying the Christian faith and giving it shape). So also, the “Orthodox of the Diaspora” are probably the only reliable link with today’s “ecumene.” It was thanks to the Jewish Hellenizers that Christianity had its first opening in the purely Greek-Roman world, and that the first mixed Christian communities of Jewish Hellenizers and Greek Christians sprang up at Antioch. Something similar is happening today in the New World. The Orthodox in USA opened unexpected avenues for dialogue between Orthodoxy and Christians of many kinds in the increasingly pluralistic world of our time. 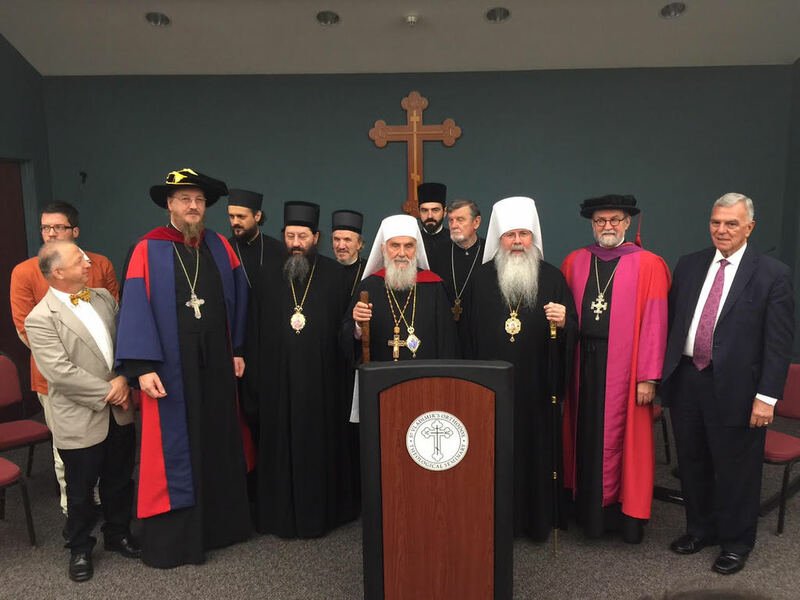 For the sake of further strengthening and establishing of our church life and witness in America, it is necessary to declare the unity of all Orthodox people through keeping communion with each other and for this purpose the bishops of all Orthodox peoples in America have been working together in a common episcopal assembly for North America. Our younger generation can take the example of St. Sebastian: a child born in San Francisco who was instrumental in opening new avenues for dialogue between the Church and the world; eventualy he became a saint, and demonstrated that any child in this country can achieve holiness. We are convened here on a heartrending day, September 11, when a tragedy of tremendous proportions with unforeseeable consequences for the entire world took place. The terrorist acts incite the justified indignation of all people who value human life, freedom and justice. Our Serbian people have also witnessed terror and deep sorrow since Serbia, the country and its people, has lived, a true martyrdom in the last sixty years: we experienced the inhumanity and horror of both the Marxist-communist and the capitalist-“liberal” aspects of historical materialism. But the martyrdom of the Serbs at the westerners’ hysteria over Milosevic resulted in the appear­ance of young generations open to theology, sensitive to the key issues of cosmic-theory, of ethos and mentality, through the relational experience of the Church—a cross-resurrectional testimony to the True Life in Christ. In these perilous and uncertain times, the barbarity perpetrated against Christians, Muslims, and vulnerable communities in the Middle East by the self-named Islamic State in Iraq and Syria (ISIS) as well as other jihadist groups has claimed numerous innocent lives and driven countless people from their homes. In this regard, our Orthodox Church calls for the immediate cessation of military action, liberation of captives, and establishment of peace in the region through dialogue, because Christians in the Middle East are a leaven of peace; so peace for all people also means peace for Christians. So many instances of persecution against Orthodox and other Christian populations both in Syria and in Kosovo have gone unnoticed and unreported by the U.S. media. In these countries Christians are at best second-class citizens, and are sometimes even treated as aliens in their own countries, denied basic civil rights and the protection of law. Let us hope that this trend and narrative which is common in the Western societies will be reshaped and let us pray for the return of refugees and for the survival and protection of the remaining Christian population. Theology in our times must be inspired by visions such as that of Fathers Florovsky, Meyendorff, and Schmemann in continuing to bear witness, to confess, and to proclaim the Mystery of Christ, the transformation of the entire reality of the salvation of the world, with the communal and “catholic” character of the Eucharist as a “gathering in one place,” which ends with our participation in the Supper of the Kingdom. When late Patriarch Pavle visited St Vladimir’s Seminary, he gifted the school with an icon of St Sava of Serbia. Please, allow me to present my gift—the icon of Saints Sebastian of San Francisco and Mardarije of Libertyville. St. Maximos’ words apply well to the lives of our two newly glorified saints, Sts. Mardarije and Sebastian: “It is not the man who worships God with words alone who glorifies God in himself but he who for God's sake bears hardship and suffering in the quest for virtue. Such a man is glorified in return by God with the glory that is in God, receiving through participation the grace of dispassion as a reward for virtue.” (St. Maximus, Second Century on Theology, 72, Philokalia, vol. 2, p. 155). Let us pray that the two new American Saints, “wise as serpents and simple as doves” (Mt 10:16) will be new wellsprings of holiness for the grace-thirsty land of America. May they also strengthen St. Vladimir’s Seminary for many years.